Everett Public Schools in Washington, like many districts, is filled with students who have high aspirations. Parents and school staff share these aspirations for their students. In a recent survey, Everett found that over 90% of students aspire to attend a four-year college. While Everett is recognized for a high graduation rate, the college-going rate for the district is around 62%, with slightly under half of those students enrolling in a four-year college program. Jeanne Willard, Director of On-time Graduation, and Becky Ballbach, Director of Student Support Services, have taken note. This year, they have a new strategy to help more students reach their goals and have every student be college-ready by the time they leave high school. With disparate systems covering different aspects of post-secondary planning, Willard and Ballbach wanted to provide students with one place offering high quality, comprehensive resources for students, families and staff. “We didn’t have that one-stop shopping. And none of our tools did all that Naviance does,” said Ballbach. The backbone of their strategy is the implementation of a comprehensive counseling curriculum. The district chose the Naviance College and Career Readiness Curriculum to serve as the core content for college knowledge, early financial planning and non-cognitive skill development. They follow David Conley’s research, (EPIC) who has recognized these areas as being critical for student success, since they aren’t necessarily taught in core classes. They will incorporate the Naviance Curriculum into English, History, AVID, GEAR UP, and a culminating senior seminar. As students progress, they will create an electronic plan that, as Ballbach says, evolves as their aspirations and goals change over time. It’s a “living plan” that will help all school staff and parents stay informed of students’ progress so that they can effectively guide them along the way. Willard and Ballbach also noted that many of their students aren’t sure if they will be able to earn admission at a four-year college. 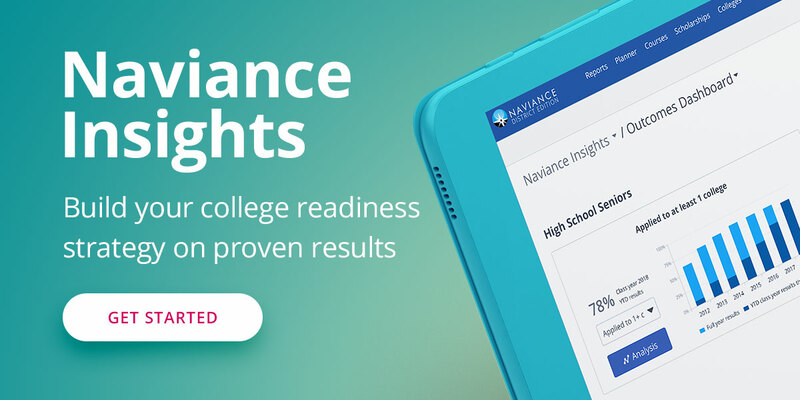 They plan on rolling out the Naviance feature that allows students to see colleges that have accepted students from their high school who have a similar GPA and test scores, helping students gain confidence that they can be accepted to similar institutions. The College Match feature shows a student the colleges that have accepted students from your high school with a similar GPA and standardized test scores. Ballbach and Willard are also getting ahead of changing requirements with Washington’s High School and Beyond Plan. Starting with the class of 2019, every student must have a personalized success plan prior to starting 9th grade. This includes their personal story, their learning style, their goals for high school and goals for after high school. Everett wants students to begin developing these plans in 6th grade. They will use Naviance and the Naviance Curriculum to help students see how others have overcome challenges, giving students the confidence to persevere and reach their goals.